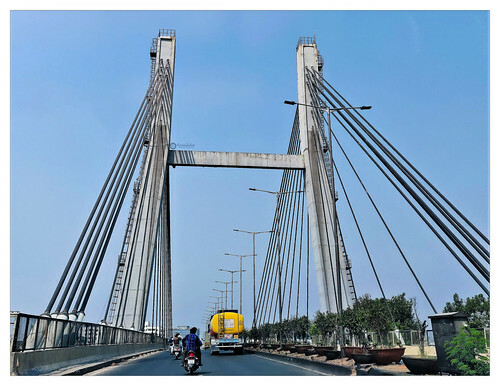 The cable stayed suspension bridge on the junction of Old Madras Road and Outer Ring Road in Bangalore National Highway-4 is popularly known as 'hanging bridge'. The 230 meter bridge including the 180-meter cable stayed portion, was constructed by South Western Railway above Krishnarajapuram (KR Pura) Railway Station. The Bridge was inauguarated by the former PM Atal Bihari Vajpayee in 2003 and was subsequently declared as the Most Outstanding National Bridge by the Indian Institution of Bridge Engineers in 2009.